Average Height	: 23" - 28"
Average Weight	: 70 - 120 lbs. Lone Star Bernese Mountain Dog Rescue Inc. The Bernese Mountain dog originated in the Swiss mountains. Many 18th century paintings show dogs that look like a Bernese type dog. The breed was named for the Canton of Bern in Switzerland. They were working dogs particularly good at draft work, pulling carts to market. They also were used to drive dairy cattle, to watch over the farm and as companions to the farmers. By the end of the 19th century many other working dogs were being imported to Switzerland, which brought the numbers of the Bernese down as workers began to use other types of dogs. An effort was made by a group of people including Professor Albert Heim and Franz Schertenleib to preserve the breed. They went around finding what remaining dogs they could in order to stabilize the Bernese. Today the breed makes a wonderful companion and they still to this day enjoy whatever draft work you can give them. The Bernese Mountain Dog appears in written descriptions during in the mid-19th century and was described as a traditional farm and herding dog used throughout the Alps. The dogs became increasingly popular as the popularity of professional dog breeding and showing rose throughout the start of the twentieth century, and the Bernese Mountain Dogs were one of the earlier breeds recognized by many kennel clubs around the world--thanks to the efforts of a number of Swiss "Sennenhund" enthusiasts, of course. Yet the longevity, purity, and early popularity of the dogs for professional breeders (with the exception of the AKC) has led to dramatic problems for the Bernese Mountain Dog in recent years--problems related to heredity and inbreeding, including a genetically induced propensity for cancer, have conspired to shorten the lifespan of this once-hardy breed. The Bernese Mountain Dog is one of the oldest, most beautiful breeds of working dog recognized by the kennel clubs of the world--yet also one of the most fragile in certain ways. In its short life, however, the dog provides its owners with a sense of beauty and loyalty not often equalled by other breeds. Berense Mountain Dogs are gentle, loyal dogs above all. The fragility of the breed isn't readily apparent from its appearance: a distinctive tri-color coat, a stocky, muscular form, and a blazing white cross of fur on their breast. But years of isolated environments and inbreeding have conspired to keep the Bernese Mountain Dog's genetic line pure--but have also given it its share of problems, shortening the breed's average lifespan considerably in recent years. Perhaps it's a necessary trade-off, however. One can't have everything, as they say--and the Bernese Mountain Dog's excessive degree of loyalty and beauty, the product of dedicated breeding and preservation for centuries in the Swiss Alps, may have been paid for, tragically, by its too-short life. If there's only one word to describe the Bernese Mountain Dog, it's "loyal". The chief goal of the Bernese Mountain Dog's life--however brief it may be compared to some other breeds--is to be a loyal, helpful companion to you and your family. This has its advantages and its disadvantages, of course. The chief advantage of the Bernese Mountain Dog's friendly temperament is the ability the dogs have to integrate themselves into virtually any kind of family environment. Children or other household animals are not a problem whatsoever for the Bernese Mountain Dog (though of course the earlier it gets to know its fellow housemates, the better it will deal with them in adult life.) The Bernese Mountain Dog's herding instincts make it a natural with animals (or children) that it perceives as "lower" than itself in the pack hierarchy, and the dogs will serve as ideal watchdogs and protectors for even the most recalcitrant of children or the most vicious of cats. The chief disadvantage of the Bernese Mountain Dog's temperament, however, is its neediness. The Bernese Mountain Dog has a powerful, genetically-rooted need to please its humans--which means that you'll have to devote a great deal of attention to this dog in order to keep it happy and to keep it out of trouble. Training is also more difficult for the Bernese Mountain Dog than for some breeds--although the Bernese Mountain Dog will try assiduously to please you, it doesn't have some of the cunning other breeds exhibit, which allow them to learn the rules quickly (and even sometimes to use the rules to manipulate you.) So training a Bernese Mountain Dog will require a great deal of patience, however good the dog's basic intentions and will are. Another major quality of the Bernese Mountain Dog is its laziness--surprisingly, given its genetic heritage. The Bernese Mountain Dog is only willing to exert large amounts of energy for fairly short periods of time, preferring to simply be with its humans or to engage in short bursts of work followed by rest. This can be a negative quality if you prefer your dogs to be active companions--but it can be an extremely positive quality if you're used to dogs whose abundance of energy leads to destructive behavior if you leave them alone for more than an hour or two. The Bernese Mountain Dog is prone to a few serious Health Problems. In recent years, the Bernese Mountain Dog's average lifespan has plummeted from around 10-12 years to a scant 6-8 years--assuming the standard "dog years" trope of seven dog years to every human year, this is like a cherished friend dying in his or her early forties. 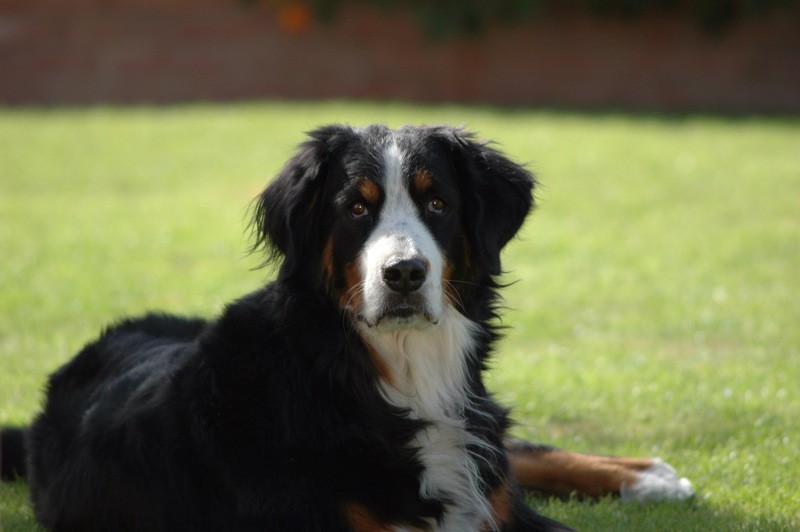 It's important to get your Bernese Mountain Dog checked as frequently as possible by a qualified vet for signs of cancer in order to reduce the risks of your pet dying from this terrible disease. First, there's the bad news: Bernese Mountain Dogs shed year-round, and shed heavily. Because of this, you'll need to take care to brush and shampoo the dogs whenever they're shedding the most heavily in order to keep their fur healthy and in order to keep as much of it as possible under your control and off of your furniture, of course. During periods of less heavy shedding, you can often get away with a normal session of brushing and combing once a week, or even once every two weeks. For a working dog, the Bernese Mountain Dog is surprisingly lazy. Due to the breed's heavy bone structure and propensity for joint problems, the Bernese Mountain Dog tends to be active and energetic for only short bursts of time every day. This can be a relief for some owners who are less active themselves, but it can also be a disappointment for lovers of large working dogs or mastiffs who're expecting a companion for long bike rides, country jogs, or other high-endurance, high-energy canine activities. Probably the best way to exercise your Bernese Mountain Dog is simply to take long walks (or even extremely slow, light jogs) with it around your city or through a local park. The Bernese Mountain Dog will enjoy your close company and loyalty, while at the same time enjoying the opportunity to get outside and exercise. While indoors, you might also exercise your Bernese Mountain Dog with some light fetching activities or some tug-of-war games. Although the Bernese Mountain Dog can't keep up with these activities for as long as some other breeds (and as long as you don't expect as much interest in the tug-of-war games as a more aggressive, territorial breed might show), they'll again be grateful for the company and bonding with the family that the activities create. For the Bernese Mountain Dog, loyalty is everything--expending energy is only a secondary goal. So keep this in mind when exercising your dog. The Bernese Mountain Dog lives for a fairly short period of time, compared to many dog breeds--even when compared to its fellow large working dogs, typically among the more short-lived of dogs. This, plus the unusually late maturity of the Bernese Mountain Dog, creates a few problems for the dedicated trainer to solve. First of all, the Bernese Mountain Dog is slow to mature physically. When coupled with the genetic hip problems found in the breed, this can mean that the Bernese Mountain Dog will be at risk of injury while learning even simple jumps, rolls, or other physical tricks. It's important to avoid such tricks until your dog is at least two years old, so that an early-life injury doesn't permanently hamper the growth and abilities of your Bernese Mountain Dog. Another problem is that the Bernese Mountain Dog is slow to mature mentally. The Bernese Mountain dog's low level of early maturity prevents you from training the dogs too rigorously during their puppy years--usually the most productive years for training, in that the dogs don't have any bad habits to "unlearn" before they can learn good behavior. Add to all of this the Bernese Mountain Dog's lack of enthusiasm and energy for long periods of activity and you begin to grasp the overall scope of the problem. The key to training a Bernese Mountain Dog, then, is to train them when they're slightly older than the average dog--starting heavy training at around two years is best--and to train them for short bursts every day rather than marathon obedience sessions, focusing on positive rewards whenever possible and varying activities so as to keep training interesting. If followed consistently without overtaxing (or endangering) your Bernese Mountain Dog, you can get your "three years a good dog" without too much trouble--and the overall health you've helped to preserve in your dog may give you your "three years an old dog" as well, or even more.